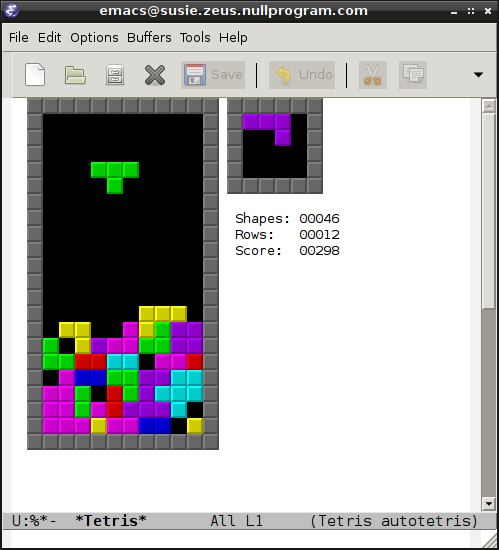 For more than a decade Emacs has shipped with a Tetris game (M-x tetris). For those who are too busy to actually play it, this package will automatically play Tetris in Emacs for you. Load autotetris-mode.el and run M-x autotetris. It will run tetris with the autotetris-mode minor mode enabled, which tells Emacs to play automatically. The mode can be enabled or disabled at any time, allowing a human to either take control or pass back control mid-game.